CD reviews: "Live at the Sands (Before Frank)" and "Count Plays Duke"
These reviews first appeared in the August 29, 1998 edition of the American Reporter. 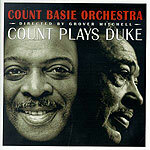 The Count Basie Orchestra is one of the last of the original big bands that can still be considered legitimate. Only Les Brown's ongoing Band of Renown, the Ellington outfit (now led by Duke's grandson) and Tex Beneke's swinging combo still come to mind as remaining artistically alive. True, Basie himself is gone, more than 15 years now. But unlike the "ghost" bands operating under the names of Glenn Miller or the Dorseys, the Basie outfit still has original members  men who played for and were originally hired by the man whose name fronts the band. The Basie band is now led by trombonist Grover Mitchell, himself a longtime Basie sideman. With fellow alumni Robert Ojeda (trumpet), William Hughes (also trombone), drummer Butch Miles, and Kenny Hing and Frank Wess (reeds), Mitchell has the band playing up to Basie standards on its new release, "Count Plays Duke." In fact, only briefly did the Basie outfit ever falter  immediately after the Count's death in 1984, when reedman Eric Dixon took over for a few months, the band was flat. But former sideman Thad Jones restored the band to its former luster before his own death in '86, and longtime arranger/saxophonist Frank Foster led the band for nearly a decade before giving way to Mitchell. Beginning with Jones, and continuing through Foster and Mitchell, the Basie band has differed from the "ghost" bands in that it continues to add to its repertoire, continues to change arrangements, continues to appeal as much to jazz fans as to nostalgia. It is, in short, a living thing  not a museum piece. Only the Ellington band, led for many years after Duke's death by his son Mercer and now Mercer's son Paul, has been as adventuresome as the Basie band since their respective founders' deaths. But Jones, Foster and Mitchell have all also been aware of the name they carry forward, and the new release  as with releases done under the leadership of Jones and Foster  still has that Basie feel to it. The horns hit their notes as one, the beat crackles, the music begs to be danced to. Given Basie's lifelong admiration of Ellington, the focus of the new album on the Ellington book is a nice touch. The selection of songs covers both well-known classics ("Take the A' Train," "Mood Indigo," "Do Nothin' Till You Hear From Me") and lesser-known gems ("The Star Crossed Lovers," "Love You Madly"). Allyn Ferguson's arrangements offer new insights to Ellington's music, bring out new colors and tones not found even in Duke's own arrangements. The soloists are, as one would expect from a Basie ensemble, wonderfully literate in their improvisations. Tasteful, insightful and warm, their playing provides a very definite Basie-like take on Ellington's music. The entire album is, in short, a wonderful recording, a definitive interpretation  and likely to be one of the nominees for big band Grammy next year. Also being added to the Basie canon is a previously unreleased set of live recordings from Basie's days backing Frank Sinatra at the Sands in Las Vegas during the early '60s. "Count Basie Live at the Sands (Before Frank)" contains 14 instrumental tracks taken from sets the Basie combo played with Sinatra. These come from the same period as the "Sinatra at the Sands" double live LP that put Basie and Sinatra together with producer Quincy Jones. While most music critics rate the Basie bands of the late '30s and the mid-'50s as his two best, this mid-'60s edition that backed Sinatra had as much spark and fire as any. Eddie "Lockjaw" Davis was as good a tenor saxophonist as Basie ever had outside Lester Young  and Lockjaw blew a hell of a lot harder than Prez. The other featured soloist here, trombonist Al Grey, was one of the best ever to take a plunger mute to a horn. The drummer for these recordings was the dynamite Sonny Payne, with bassist Norman Keenan and the irreplaceable Freddie Green on guitar rounding out a very hard-driving rhythm section. Current Basie Band leader Grover Mitchell also held down a trombone chair here, with reedmen Marshall Royal and Eric Dixon also notable contributors to this session. The songs were culled from the short opening sets over the course of four nights in early 66; the selection ranges from Basie standards like "One O'Clock Jump" (the band's theme song), "Jumpin' at the Woodside" and "Splanky" to pop songs like "I Can't Stop Loving You" and "This Could Be the Start of Something Big" to (what else!) Ellington covers like "Satin Doll" and "Hello Little Girl." Longtime Basie fans who still hunger for something new from the Man himself will be blown away by the clarity of these live recordings, the tightness of Quincy Jones' arrangements and the general energy of the band (which always seemed to play better in front of a crowd). Newcomers to Basie's music will be left wondering why the hell they waited so long to discover one of America's best musical treasures.